Genuine Fender® TBX Tone Control. The Fender® TBX Tone Control will also work in place of any standard tone control on any guitar with passive pickups. Some American Standard Strat's are equipped with this tone control to cut either treble or bass instead of the standard style that attenuates treble only. When the control is set at the centered detent, it is off. Turning the control one way cuts treble; the other way cuts bass. The TBX can be also be wired as a master treble/bass control. Can be used with the Telecaster or Stratocaster® or any guitar with passive pickups. 3/8" threaded bushing length. 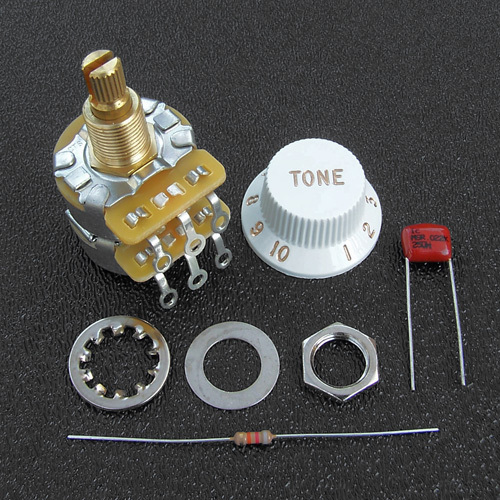 Includes dual stacked potentiometers consisting of a 1 Meg potentiometer and a 250k potentiometer, 0.022 uF capacitor, 82k ohm resistor, mounting hardware (nut, lock washer and dress washer), white tone control knob and installation instructions for Telecaster or Stratocaster. Same circuit as used on the Eric Clapton Strat.